My favorite project has to be his homemade bandsaw. How many of us would even attempt that? Other noteworthy items are a vehicle with wooden tank treads, a homemade pipe organ, various projects with homemade wooden gears, a wooden air engine, and a marble shooting crossbow. He provides plans for some of his projects, some are free, and for some he charges a modest fee. 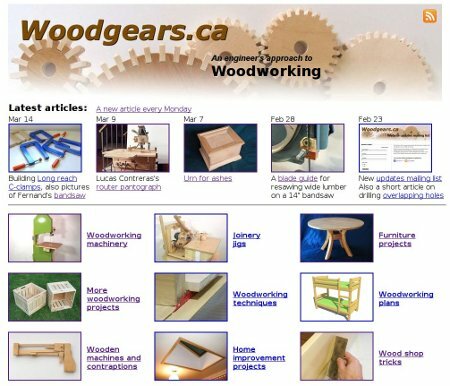 Besides projects, Wandel offers woodworking tips and jigs and features other cool projects from readers. I’d highly recommend setting aside some time to look around his site. Every time I check it out, I get excited about going down to my own shop to see what I can create. i enjoy his website . . . he’s so woodworking geeky in a good way. really like the stuff about the family tourist camp and his dad the woodworker, furniture builder, sawyer and pretty darn tootin handy fella all the way around. a site worth rummaging around in. Very cool to see the old way of doing things. i also really enjoy his sight – i like its frequent updates and pretty clear layout. i also like his non-snobbish approach. he builds lots of complicated stuff, but it seems like most of his furniture is actually made out of dimensional lumber. cant find the pic for the air engine–and want the pattern—help!!!!! !